JSTOR is a database of scholarly journals in the humanities and social sciences. 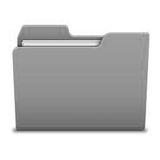 You can search the whole database or narrow your search to one or more disciplines. Multidisciplinary index to both scholarly journals and popular magazines. Strongest coverage is of the last twenty years. Uses Google search engine to search scholarly articles and books. Use the PennText button on the right to connect to Penn resources. Provides literary criticism, biographies, text overviews, and reviews of works by writers from all disciplines, time periods, and nationalities. LION is a searchable, full-text collection of over 250,000 works in English and American Literature. Separate databases are English Poetry (1100-1900), American Poetry (1600-1900), African-American Poetry (1750-1900), English Drama (1280-1915), Eighteenth-Century Fiction (1700-1780), Early English Prose Fiction (1500-1700), The Bible In English (990-1970), Editions and Adaptations of Shakespeare (1591-1911), Modern Poetry (1972-1997). Includes eleven titles, including Dictionary of Literary Biography (DLB), Drama Criticism (DC), Literature Criticism from 1400 to 1800 (LC), and Shakespearean Criticism (SC). 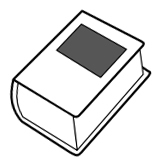 Article citations have a journal/periodical title in addition to the article title. They will usually also show a volume and issue number. Ostriker, A. & Ginsberg, A. (1997). "Howl" Revisited: The Poet as Jew. The American Poetry Review, 26(4), 28-31. Raskin, J. (2004). American Scream: Allen Ginsberg's Howl and the Making of the Beat Generation. Berkely: University of California Press. 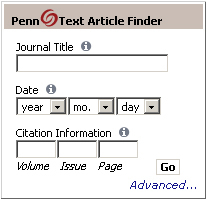 If you have a complete article citation, or even just a journal title, you can use the PennText article finder on the Library homepage. Book not at Penn? Request it from another library using BorrowDirect or EZ-Borrow! Monday-Thursday 8:30am-10pm, Friday 8:30am-6pm, Sat 12noon-5pm, Sunday 2pm-10pm. Online guide to working with topics, finding information, and more. There are lots of resources available on the Van Pelt Library homepage.